I had the strangest dream last night. I was releasing a recently rehabbed baby opossum at the Brackett Park ball fields, in South Minneapolis. He was an exceptionally cute, friendly little baby of an opossum, and so small that I was concerned about his ability to take care of himself. As he exited the pet carrier I knelt down and petted him gently, murmuring reassurances that he was going to be OK.
A large, hairy, middle aged man in a plaid shirt and jeans approached and asked me what I thought I was doing. “Petting the ‘possums” I replied, rather sheepishly looking down at my shoes. He glared at me disapprovingly, then abruptly turned on his heel and strode off. It hit me this morning, as predictable and implacable as an IRS auditor: Headache, malaise and fatigue, listlessness, loss of appetite, lack of interest in all other activities normally found pleasurable. The now-familiar symptoms, which appear to recur like clockwork every couple of years, decidedly point to a DSM III diagnosis of acute Post-Potter Depression. Although the syndrome was identified more than a decade ago, the medical research community has yet to develop a cure. 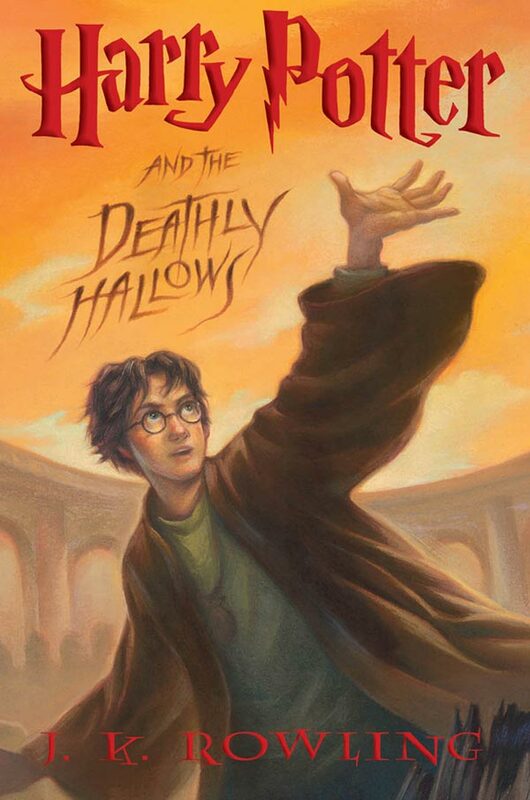 To my surprised delight, late Saturday morning DH* presented me with the long-awaited prize: A brand spanking new, 8-pound, beautifully golden dust-jacketed first edition hardcover of “Harry Potter and the Deathly Hallows”. I proceeded to express my considerable appreciation in exactly the manner that someone in my position would: By consuming the 700-and-whatever pages tome in as little time as humanly possible. In my own defense I must state that I feel I exhibited great personal discipline by delaying the start of my Potterathon until 9:30 Saturday evening, after having fulfilled the various social obligations I had made prior to the presentation of the precious piece of fiction. DH* actually had the temerity to interrupt my Sunday perusal with the suggestion that the lawn was in dire need of attention from both myself and the vintage Lawnboy™ residing in our garage. In return, I had the temerity to suggest that if he truly wanted the lawn mowed this particular weekend, he would not have gifted me with the final Harry Potter opus. I was pleased to finish the book off at 11:15 p.m. last night, just in time to further skew my already odd panoply of dreams, and today I am suffering the consequences. I have no access to the necessary ingredients for a polyjuice potion and have never quite gotten the knack for performing health and happiness charms. * Most frequently: “Dear Husband”, but upon occasion may denote “Disagreeable Housemate”. OK, I don’t intend to frequently post video links here, but this particular video is so beautifully done and touched me so deeply that I can’t resist sharing it. This sums up why I continue to swim against the tide of human-induced wildlife deaths, why we do what we do despite the frequent heartache and difficulty of the task. This is why we are wildlife rehabbers. The message here is right on target: If you find a cottontail nest and have no reason to believe that the mother rabbit has been killed, the right thing to do is to leave it alone!! Put the babies back, cover up the nest, and go away. Mama bunny does not spend most of her time at the nest because she does not want to draw predators to it (she only visits a couple of times a day to feed her babies) so you should not be alarmed by a nest without an adult present. If you are unsure whether the mother is caring for her bunnies you should arrange natural materials on top of the nest (i.e. twigs or pebbles) and check back 12 hours later to see if they have been moved. Most importantly, keep your dog and/or cat away from the nest! It only takes 2-3 weeks for the babies to leave on their own. Be aware that mama bunny is far and away the most successful caregiver a baby bunny could have, and easily superior to human caretakers. People have no business kidnapping baby bunnies simply because they find them cute. The only circumstances under which bunnies should be removed from the nest is if they have either been directly attacked by a predator (in which case they need medical attention) or their mother has been killed. In either case the bunnies *and* nest material should immediately be brought to a licensed wildlife rehabber (easily located online by googling the name of your state and the words “wildlife rehab”). The amazing individual rehabber who made this video had approximately a 70% success rate, which is phenomenal. The large rehab center where I volunteer has maybe a 50-60% success rate. 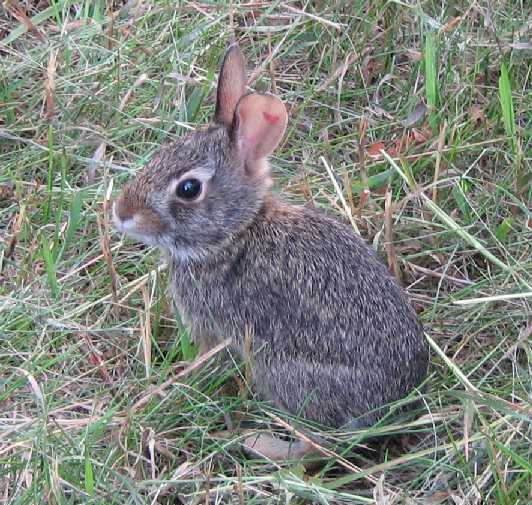 Mama Cottontail’s success rate is probably closer to 90% so long as the nest is not disturbed by a predator. The diarrhea that the rehabber in the video refers to is brought on by formula feedings and the considerable stress of captivity, and is easily the biggest threat to the bunnies I care for. Bunnies have incredibly delicate digestive systems and it is impossible for humans to duplicate the diet that nature intended, yet is easily provided by their mother. If we love wild things, the best gift we can give them is to let them be wild and live out the lives they are meant to live. [Holding breath] I’ve never blogged before, and haven’t a clue what I’m doing with the site softwhere, but what the heck. You only live once. I don’t have to tell anyone about it if I don’t want to, right? I’ve been looking for a good blog site for a while (starting when Gather was banned at my workplace) and since both the estimable Mr. Rochester and the irrepressible Bongo Mirror appear to find this one to their liking, I’ve decided to give it a try. Whether I stick around is largely dependent upon whether the irritatingly irrational internet filter at my place of employment [sigh] labels this site unseemly and undesirable. It thinks a toilet de-clogging device is a “weapon”, so I have a feeling this low-key site may be safe. In time I plan to move my favorite Gather writings, mainly my wildlife rehab stories, to this site. More later. It’s too nice outside to be tapping on a computer keyboard indoors. The least I could do is take my laptop outside on the deck!